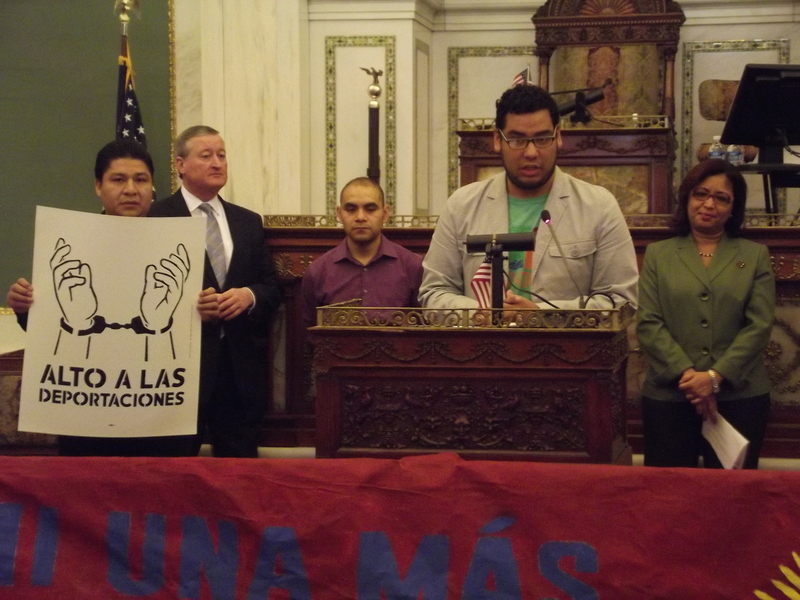 Breaking the ICE Holds// Philadelphia City Council "Getting It Right" on Immigration. Philadelphia – City Council began the first stage of an examination of the administrative and financial cost, along with the practical necessity of the city’s ongoing collaboration with the U.S. Immigration and Customs Enforcement (ICE), this week, and specifically looked at the use of “ICE holds” prior to deportation. An ICE hold typically occurs when a person has been stopped or detained – often involving a minor traffic violation. Under Secure Communities, in the process of obtaining personal information and fingerprinting, the law enforcement agency’s database is shared with Immigration & Customs Enforcement. If ICE agents notice an individual with a warrant, a re-entry charge or a previous conviction, they will request the police department do them a favor and “hold” the person for forty-eight hours. The local law enforcement officers are under no legal obligations, nor are the ‘ICE-holds” mandatory. Studies have found, however, that the “ICE hold’ process is prone to mistakes, and individuals are often mistakenly identified, resulting in innocent persons being detained for deportation. Cristobal Valencia of the South Philadelphia-based Juntos group, followed Ms. Pacheco and echoed many of her assessments, saying that the use of ICE holds was “undermining the trust” in the police department. Noting that a number of “sister cities” have much “more progressive” policies regarding undocumented immigrants and the role of the local police, Councilwoman Quinones Sanchez urged opening the subject to “discussion” and examination in Council Chambers. Dismissing the need to follow the recommendations of federal officials who generally, “don’t want to help us with education,” but want to help us with deportation, the Councilman spoke of looking to other cities. Of the 368, 644 deportations in 2013, the Department of Homeland Security reports that 59 percent or 216,810 of them had prior criminal convictions. Of the other 151,834 deportations, D.H.S. reports that 84 percent or 128,398 were apprehended attempting to cross the border. Philadelphia- In announcing the closing of the Mondelez, Inc. Bakery and former Kraft/Nabisco baking plant in the Northeast, in February, Cindy Waggoner, the V.P. for Integrated Supply Chain Biscuits for Mondelez, Inc., described the decision as “bittersweet.” For the 350 workers, families and neighborhood businesses affected, the shuttering of the iconic company had little that was sweet. 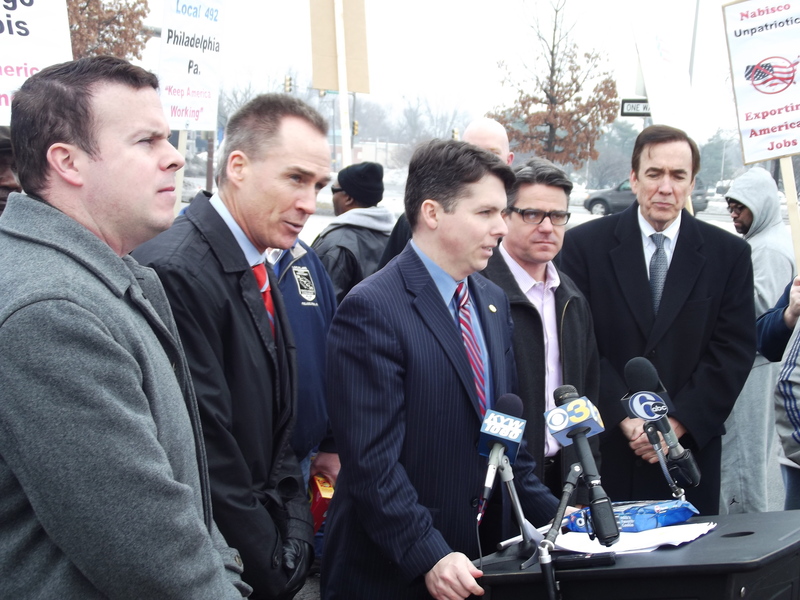 In the shadow of the historic Philadelphia bakery that still bears the name ‘Nabisco/Kraft” on its walls, a group of State Senators, Representatives and City Councilmen stood in solidarity with members of the Bakers and Confectionery Workers’ Union Local 492, Wednesday, Feb. 19, denouncing the Mondelez International company for what it called “greed,” and a failure to deal “honestly” with workers, families and communities that are impacted by a planned 2015 closure. According to the President of the Bakers and Confectioners Union, Local 492, John Lazar, the average worker at the former Nabisco/Kraft bakery earns between $15 and $25 an hour. Mr. Lazar also recalled that in negotiating with Mondelez, the union was willing to make concessions on a variety of issues: wages, pensions, healthcare, part-timers and flexibility in work rules. In attributing the situation at the former Kraft plant to “structural changes in the economy over the last twenty years,” and “free trade agreements,” Rep. Kevin J. Boyle argued, “Free-trade is not fair-trade. What’s being done by Mondelez is simply busting the union, and sending jobs to southern and right-to-work states” or abroad. “It’s a betrayal of why my Father came here for at the age of nineteen,” said Rep. Boyle, adding that his father lost a job when a Philadelphia Acme Warehouse closed. Within a year, Kraft CEO Irene Rosenfeld announced the closing of the Somerdale plant, leaving its “outraged” 400 employees to demand an apology for “broken promises,” according to news accounts. Small Business Forum on Obamacare at Hispanic Chamber of Commerce. That was the message delivered by Joanne Grossi, the Regional Director of the Department of Human Services, and echoed by Natalia Olson-Urtecho, Mid-Atlantic Regional Administrator of the U.S. Small Business Administration, addressing some fifty small business proprietors and leaders of community-based organizations, Thursday, at a seminar on the impact on small business of ACA or what is also known as Obamacare. “This piece of legislation will change America dramatically,” said Varsovia Fernandez, President of the Greater Philadelphia Hispanic Chamber of Commerce, opening the discussion from the GPHCC’s Broad Street headquarters. Since the Affordable Care Act went into effect in 2010, Ms. Grossi noted that health care costs -as a proportion of the nation’s GDP- have dropped to 17.2 percent. Moreover, as various provisions of the law have unfolded the number of uninsured has steadily declined. Other provisions of the ACA prevent discrimination against those with pre-existing conditions; and of the 10.2 million uninsured Latinos, some 6.1 million have a pre-existing condition. Under the Affordable Care Act any small business with fifty or fewer full-time employees can provide health coverage for employees and they will qualify for a Small Business Health Care Tax Credit to lessen the cost. Among the parameters of the health care credit, the full-time employees must earn wages below $50,000 and the employer must contribute at least 50% toward the employees’ premium costs. In order to take advantage of the credit, Ms. Olson-Urtecho explained that the small business must buy coverage through the new small business health insurance marketplaces or exchanges, known as the Small Business Health Options Program, or SHOP. The business exchanges spur competition for customers based on prices and quality; and by pooling risks for small groups they lower overall costs. Beginning this year, businesses are eligible for a tax credit of up to 50 percent, “a credit which is limited to two consecutive taxable years,” noted David Dickson, District Director of the SBA. The ACA also provides for free preventive services under Medicare, so older employees can have blood tests, screenings, colonoscopies and other preventive services that carry no out-of-pocket costs or copays. In addition, the ACA reform addressed the so-called ‘donut hole” of the Medicare Part-D, Prescription Drug program and its gap in coverage. The gap left in the Prescription drug program, begun under Pres. George W. Bush, left beneficiaries to pay 100 percent of prescription costs at a certain threshold level. The ACA, however, will “completely close that donut hole by the year 2020.” In the interim discounts of 53 percent for brand name drugs – that gradually increase – are available to mitigate the cost. In Pennsylvania’s exchange there are as many as nine insurance companies participating, offering plans that are differentiated by “Metal Levels,” allowing consumers to compare the levels of coverage. So a young person may choose a “Bronze” plan, which has lower premiums and higher deductibles and copays; while an older employee might select a “Gold” or “Platinum” plan that has higher premiums but lower deductibles. In highlighting some of the other benefits of the ACA reform, Ms. Grossi spoke of the 80-20 rule, requiring Insurance companies to spend at least 80 percent of premium dollars on “your medical care.” As of 2012, insurance companies are required to report to the Department of Health and Human Services that they are adhering to the spending specifications or be compelled to pay a rebate to customers. Since the law was enacted more than 8 million people have received rebates, ranging from direct payments of $512 and $457, to as little as $72. Others, those receiving coverage through an employer, often received the rebates indirectly through credits. The Vice President of El Zol radio 1340 am, Uriel Rendon, raised several questions about businesses with a dozen employees or less, as well as on the high cost of family coverage. Meanwhile Mr. Gonzalez, a Legislative Aide of State Sen. Stack, questioned Ms. Olson-Urtecho about the availability of tax credits, as well as penalties, for local businesses of more than fifty employees. While there are 727,000 small businesses in Pennsylvania, employing some 8.7 million people, according to an SBA summary report, the ACA apparently affects just four percent or less than 30,000 of all small businesses in eastern Pennsylvania.